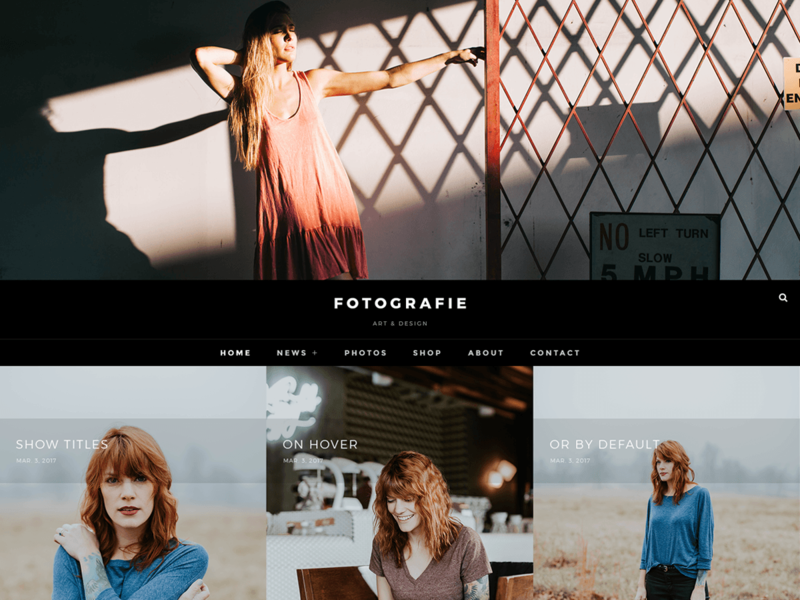 Fotografie Pro is a modern photography WordPress theme that comes with high-quality features and minimal design. True to the essence of the German word, Fotografie is simple, elegant and straightforward. It is ideal for creating photography websites for photographers, graphic designers, freelancers, artists, or bloggers. 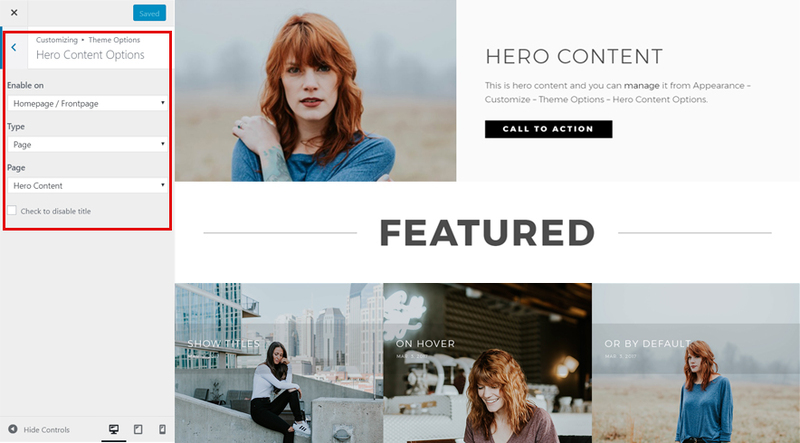 It comes with basic yet extremely crucial features like header media options, hero content, color options, portfolio, and menu options to create a simple and elegant website in no time. Fotografie Pro is creative, beautiful, engaging, and well suited for photography, art portfolio, freelancer and other creative photography-centric websites. The theme is very impressive, visually vast and stunning, graphically polished and seamless, ambitious, engaging and dynamic. Actually, Fotografie Pro has it all to take your photography websites to the next level. Also, not to forget, Fotografie is translation-ready. You can update Themes directly from the Administration Panel using Catch Updater plugin. Click here to read details about Catch Updater plugin. How to add Featured Image in Post/Page? Open the editor of the post/page where you want to display image, and locate the Featured Image module in the bottom right corner under Page Attributes. Click on Set Featured Image. If you have just changed your theme then you need to regenerate image thumbnail for post published before activating this theme. You can simply install Regenerate Thumbnails Plugin. Then Regenerate Thumbnails through “Tools => Regen. Thumbnails” in your WordPress Dashboard. Fotografie Pro currently has 12 widgetized (Sidebar) areas thay are:1. Sidebar, 2. Footer One, 3. Footer Two, 4. Footer Three, 5. Footer Four, 6. WooCommerce Sidebar, 7. 404 Page Not Found Content, 8. Optional Page Sidebar, 9. Optional Post Sidebar, 10. Optional Sidebar One, 11. Optional Sidebar Two and 12. Optional Sidebar Three. Go to “Appearance => Widgets” or “Appearance => Customize => Widgets” in WordPress. Fotografie offers exciting Menu Options! This theme supports and recommends using “Custom Menus”. You can create Custom Menu through “Appearance => Menus” from your WordPress Dashboard. You can customize this theme using cool additional features through Customizer at “Appearance => Customize” from your WordPress Dashboard. Fotografie Pro supports 4 featured content types to choose from: 1. Post, 2. Page, 3. Category and 4. Image. For Featured Content Options, go to “Appearance => Customize => Featured Content”. Featured Post Content is created to highlight your Post in the featured content. So, first you need to create a Post and then add Featured Image to the Post. When you select post, make sure your Post have Featured Image. Click here to watch our Video Screencast to add Featured Image. Featured Page content is created to highlight your Page in the featured content. So, first you need to create a Page and then add Featured Image to the Page. When you select page, make sure your Page have Featured Image. Click here to watch our Video Screencast to add Featured Image. Featured category content is created to highlight your posts from specific categories in the featured content. So, first you need to create a Post, add Featured Image to the post and assign posts to specific category. When you select categories, make sure your Posts in those categories have Featured ImageClick here to watch our Video Screencast to add Featured Image. Featured Image Content is created to highlight independent images in the featured content. This option gives you full control to upload your own independent image, with title (optional), content (optional), optional link and target. Just use the following simple steps to add in the Featured Image Content. Fotografie Pro supports 4 featured slider types they are: 1. Post , 2. Page, 3. Category and 4. Image. For Featured Slider Options, go to “Appearance => Customize => Theme Options => Featured Slider”. Features Post slider is created to highlight your Post in the slider. So, first you need to create a Post and then add Featured Image to the Post. Features page slider is created to highlight your Page in the slider. So, first you need to create a Page and then add Featured Image to the Page. Features category slider is created to highlight your posts from specific categories in the slider. So, first you need to create a Post, add Featured Image to the post and assign posts to specific category. Note: Hold down the Ctrl (windows) / Command (Mac) button to select multiple options. Features Image Slider Content is created to highlight selected Images in the Slider Content. True: Fixes the height overlap issue. Slideshow will start as soon as two slider are available. Slide may display in random, as image is fetch. Wait: Fixes the height overlap issue. Slideshow will start only after all images are available. Note: To see changes in No of Slides please refresh the customizer page. Note: If you custom feed(s) are not handled by Feedblitz or Feedburner, do not use Redirect Options. Once you are in Layout Options, you can Check the option below “Site Layout” which will set our site layout. You can add your custom CSS that will overwrite the theme CSS for further design customization through “Appearance => Customize => Additional CSS”, in your WordPress Dashboard. Fotografie supports different features from Jetpack like: 1. Portfolio, 2. Content Options and 3. Featured Content. To get these option you need to install Jetpack. To use these features you can simply install Jetpack Plugin, by following the steps provided by the link. 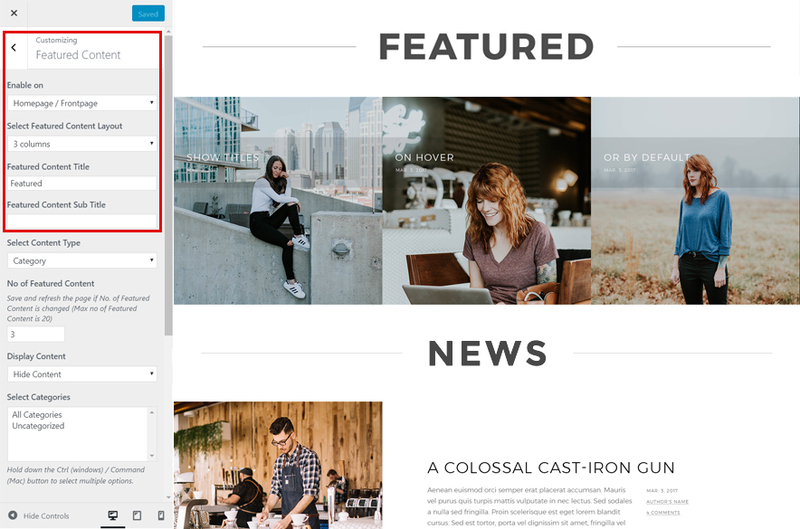 The Portfolio custom post type gives you an easy way to manage and showcase projects on your site. Content Options gives an easy way to make small visual modifications across the site. 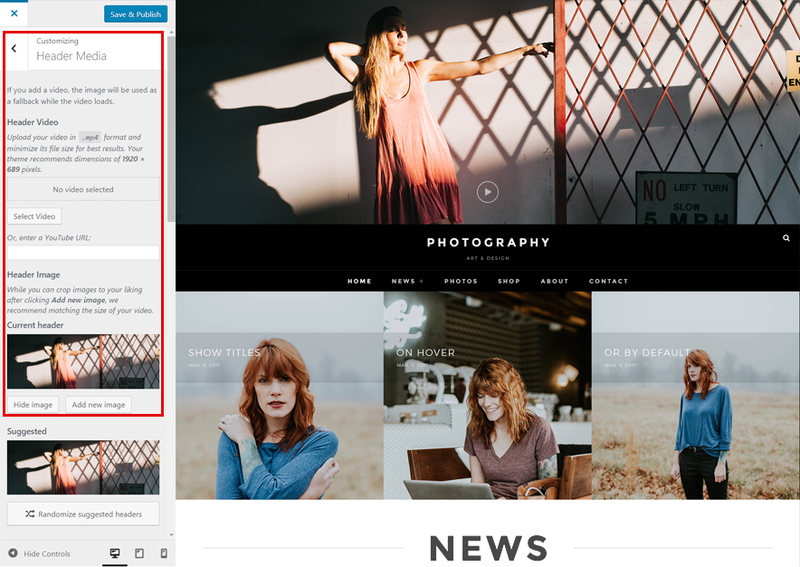 Content Options supports four main features: Blog Display, Author Bio, Post Details, and Featured Images. 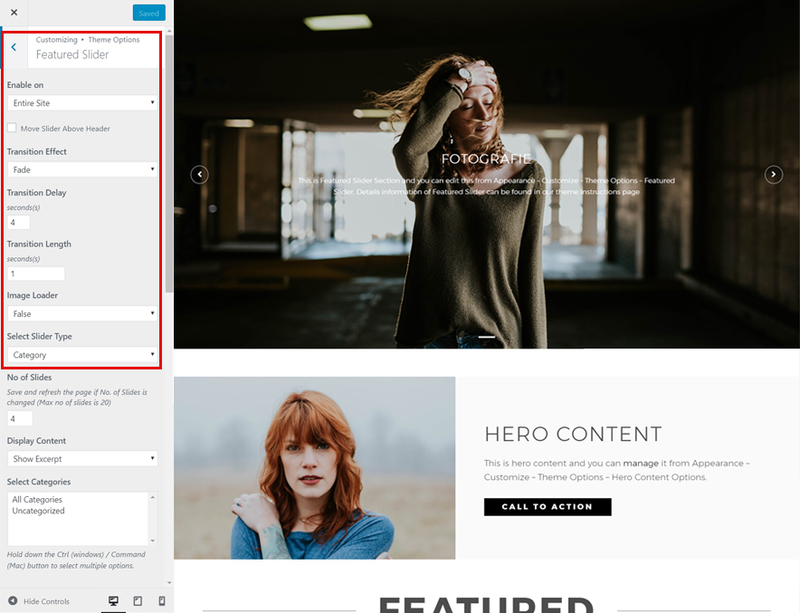 Featured Content allows you to easily feature all the post with the “featured”tag or tag of your choice, you can feature up to 3 posts in its feature content area. You can install our free plugin Essential Content Type from this link and follow the steps provided by the link. Fotografie Pro has 14 Widgets to choose from. They are: 1. CT:About, 2.CT:Advertisement Codes, 3. CT:Advertisement Images, 4.CT:Featured Embeds,5. CT:Featured Images, 6. CT:Featured Pages, 7. CT:Featured Posts, 8.CT:Gallery Images, 9. CT:Galley Pages, 10. CT:Galley Posts, 11.CT:Instagram, 12.CT:Newsletter, 13. CT: Social Icons and 14. CT: Tag Cloud. You can add widget in widget area as per your need. 1. Go to “Appearance => Widget”, then drag the widget to the widget area or you can click in the widget then list of widget area will appear, now you can choose desired widget area and click on “Add Widget”. 2. Go to “Appearance => Customize => Widgets”, then you can find list of widget area. Click on the any widget area and you will see “Add a Widget” option by click on it you can find list of Widget which you can add to respected widget area. This widget is used to add Code as Advertisement. This widget is used to add Image as Advertisement. This widget is used to add Featured Embeds Codes. This widget is used to add Featured Images. This widget is used add Featured Image. This widget is used add Gallery Image. This widget is used to dispaly gallery page with thumbnail. This widget is used to display post with thumbnails. This widget is used to display posts with thumbnails. This widget is used to add social icons as a widget. Add “Title” under the respective field.